. Find out which items are the best choices for cooking equipment that will have you beating the heat in no time. Okay, so it is a hot summer day and you know you have to feed your family. Not only that but your brother and his family of six showed up too to spend time relaxing in your pool and trying to beat the heat. You know you don’t want to turn on that oven and make anything with the air conditioner already straining to keep it cool on the inside. So, what can you do? 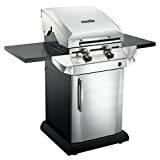 All of a sudden you remember that your beautiful and sweet loving wife of seven years bought you a top of the line barbecue for Father’s day last month. YaY! Whip out that bbq lighter and light ‘er up! This is also your chance to shine if you have a new recipe for a sauce for your ribs or chicken, or even a nice spice mix for your burgers. Toss back a few beers or a glass of wine and let the good times roll. Clean up with a barbeque can be a snap too if you use the right tools and cleaner which is the perfect end to a gorgeous summer day. Other cooking equipment which is also excellent for hot days is a slow cooker or otherwise known as a crock pot. This is the perfect tool for those people who have a ton of things to do each day and don’t have too much time to spend cooking and preparing a meal for a large family. Following easy crockpot recipes, you can put your meal into the machine, turn it on low and let it cook away by itself for hours at a time all without heating the house or worrying about not being there in case of a fire hazard. But what about those people who don’t live in homes or have backyards? 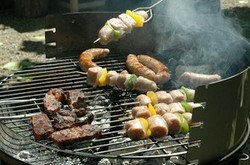 Having a barbeque is a no-no for many people who live in apartments to have on their balcony in case of fire. If you find yourself in a situation like this, then an indoor grill is a must have. I have a George Foreman grill and must admit that I would be lost without it. I cook everything on it from eggs all the way to steaks. It is made with an easy to wipe off coating on each element and comes with a flat element and a grill top. It also has little plastic trays to put underneath it to collect all the grease and keep my counters from becoming icky and slimy. Investing in items such as these that will allow you to conserve energy and save money on your hydro bill is an excellent idea and well worth the money. Most of these pieces of cooking equipment come with at least a few years warranty and if you pay special attention to how they should be washed, they can last as long as you need them to. Why worry about how you are going to feed your family on those hot days when you don’t feel like cooking when you can easily use the right tools for every occasion. I tend to lean towards cold meats and salads on cold days - but I love barbecues!